At the Apple education event on Thursday, Apple executives Eddy Cue and Jeff Robbin unveiled the iTunes U app, a new way for students and teachers to manage course material for classes on an iPad, iPhone, or iPod touch. 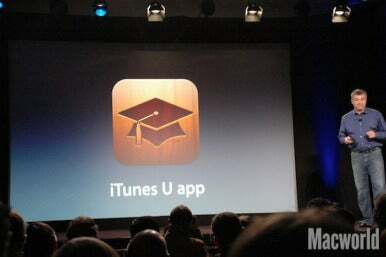 The new iTunes U app, presented during Apple's education event. While the iTunes U app provides access to the content that’s available in the iTunes U section of the iTunes Store, it also offers a means for teacher and student interaction. 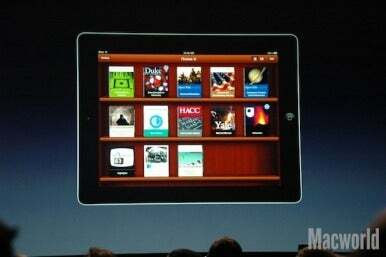 The opening interface looks a lot like Apple’s iBooks app, with a bookshelf that hosts icons representing your courses. Tap on a course, and you’ll see a list of topics on the left, such as Overview, Instructor, and Outline. These topics can be customized with additional topics. Teachers can post a syllabus, notes, and assignments to the class, and students receive notifications when new posts are available. With the assignment lists in the iTunes U app, students can mark off when an assignment is done. The iTunes U app also allows for interoperability with other media. A teacher can tell students to read certain texts, with links that send the student to the iBookstore or another source. Or a teacher can assign videos for students to watch; the student can watch a video stream, or download the videos to the iOS device for viewing at a later time. The Notes tab in the iTunes U app is a place where notes from all your textbooks and courses are gathered together. It's similar to the Notes view in the new iBooks 2 app, announced earlier Thursday. The Materials tab in the iTunes U app collects all the releated materials for a course. The materials can include audio, video, books, PDFs, Pages documents, Keynote presentations, and other apps. Missing course materials can be obtained through iTunes U.
Apple executive Eddy Cue introduces the iTunes U app at the Apple education event. According to Apple, students anywhere can take iTunes U courses with access to all course materials. Before the iTunes U app was released, only students in the classroom at that time were able to access the iTunes U content. According to Cue during the education event, iTunes U provides the largest catalog of free education content to the world, with more than 1000 universities using iTunes U to deliver education content. The free iTunes U app is available now in the iTunes Store. Apple has set up several Web resources for teachers interested in creating and distributing courses through iTunes U. You can enroll in the iTunes U portal (at the time of this writing, the site was down for maintenance). The iTunes U support site has links to several how-tos and the iTunes U support community, where you can get feedback from other iTunes U participants. Apple also notes on its iTunes U website that iTunes U is available for K-12 teachers, as well as colleges and universities. When you're ready to create a course after you've enrolled in iTunes U, Apple offers the iTunes U Course Manager, a Web-based tool. Apple offers step-by-step instructions on course creation, and materials (such as a syllabus and handouts) can be uploaded and hosted by Apple. Editor's note: Updated at 9:15 p.m. PT with information on iTunes U Web resources and course creation.